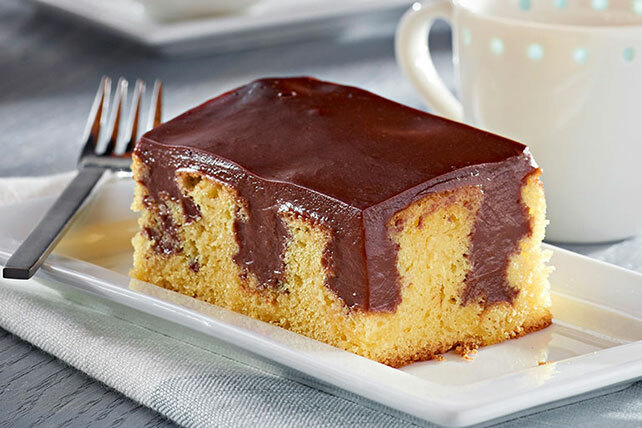 Prepare a scrumptious dessert with this Pudding Poke Cake recipe. Poke holes in the top of the cake and fill them with luscious, chocolate pudding! Prepare cake batter and bake as directed on package for 13x9-inch cake. Immediately poke deep holes in cake at 1-inch intervals, using round handle of wooden spoon. Combine dry pudding mixes and sugar in medium saucepan. Gradually stir in milk until blended. Add butter. Bring to full rolling boil on medium heat, stirring constantly. Pour over cake. For variety, experiment with these flavor combinations: yellow cake mix with JELL-O Butterscotch, Chocolate, Pistachio or Chocolate Fudge Pudding Mix; chocolate cake mix with JELL-O Chocolate, Vanilla, Coconut Cream, Banana Cream or Chocolate Fudge Pudding Mix; white cake mix with JELL-O Butterscotch, Chocolate, Pistachio, Vanilla or Banana Cream Pudding Mix. Prepare using a cake mix with pudding in the mix. Instead of using end of wooden spoon to make the holes in the cake, you can instead use a plastic drinking straw, using a turning motion to make large holes in cake.